On Thursday 6th October 2016 our suspension specialist & managing director Andy traveled to Cologne to attend one of the largest motorcycle shows in the world – the Cologne Intermot; the event that brings hundreds of thousands of motorcycle enthusiasts from all over the world together. As well as giving you the chance to brush shoulders with some of the most influential people in the industry, it can open an entire network of business opportunities, you can meet manufacturers, importers or just other general bikers with whom share the same interest or passion as you. 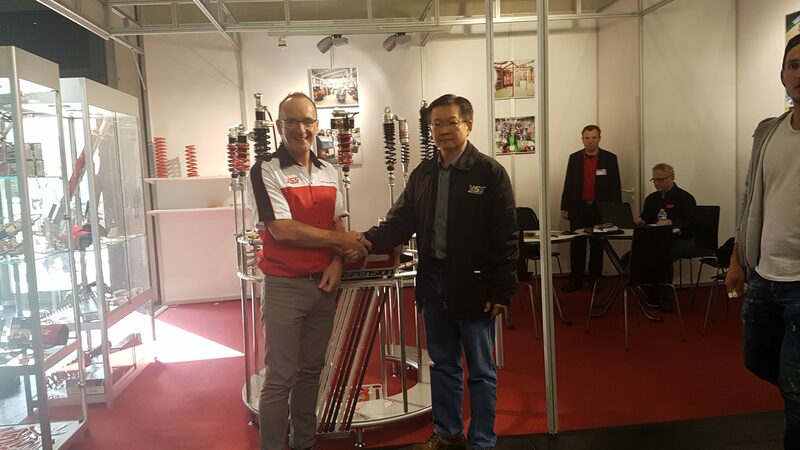 Here Andy met with Mr Pinyo, the managing director of YSS Suspension & assisted him on the YSS stand, meeting other distributors & customers of the YSS brand. He used this time to explain in detail what’s exactly involved in a shock absorber rebuild, the functionality and benefits of such a service & also what makes YSS better than the rest!